Most people who watched the venerable CBS program 60 Minutes on Jan. 3 probably weren’t blind, and didn’t tune in right in the middle of a playing segment by jazz pianist Joey Alexander. But if those possibilities aligned, anyone listening would’ve heard a musician playing with the creativity, dexterity and improvisational skills of jazz keyboard legends from Art Tatum and Thelonious Monk to Chick Corea and Herbie Hancock. That alone makes Alexander — who performs as part of the 10th annual Festival of the Arts Boca on Friday — special, but why was he featured and interviewed for the program by Anderson Cooper? Primarily because he’s only 12 years old. He’s also shown wowing the crowd in 2014 at Jazz at Lincoln Center’s annual gala in New York City at age 10. There’s a major difference, though, between these now-veteran jazz musicians and the Indonesian Alexander, who was born in the island nation of Bali. Both Djangirov and Savage entered into jazz by having to be indoctrinated into improvisation, the impromptu lifeblood of the genre, following early studies of the more exacting forms of classical music (in which improvising will cause a musician to hear echoes of a certain presidential candidate, as in “You’re fired!”). Classical and jazz are thus more demanding than forms of popular music — to the point where the percentages of those who ascend to the pinnacles of either genre are akin to athletes who reach the top of their professions. But Alexander already knows how to keep things in perspective. Still, Alexander studied neither jazz nor classical music in-depth. As detailed on 60 Minutes, parents Denny and Fara gave up on his brief classical studies once they realized his gift for improvisation. Amazingly, Alexander’s musical family (Denny plays guitar and keyboards) somehow instilled him with the innate ability to simultaneously listen, play and think on the fly, something every jazz musician seeks but only a minority master —- and only a microscopic percentage of that in childhood. Yet even Alexander admits that which is instinctive isn’t necessarily easy. “It is kind of hard,” he replied. Alexander’s parents allowed the phenom to start performing live in Bali when he was 6 years old. The closest he came to jazz lessons came at age 8, when prominent Indonesian pianist and educator Indra Lesmana allowed him to repeatedly sit next to him at the piano bench at his own Jakarta nightclub. The 2014 Jazz at Lincoln Center performance, Alexander’s United States debut, was orchestrated by trumpeter and JALC artistic director Wynton Marsalis — perhaps the world’s best-known jazz musician and one not prone to hyperbole in his infrequent praise of other veteran musicians, let alone child performers. Yet Marsalis extended the invitation after watching YouTube clips of Alexander, and appeared seated on the piano bench next to him for part of the 60 Minutes piece as both were interviewed by Cooper. Those abilities made the 12-year-old the youngest performer ever at the 2015 Newport Jazz Festival, and Alexander also released his debut CD, My Favorite Things, on the Harlem-based Motema label last year. It received two Grammy nominations, one for Best Jazz Instrumental Album and one for Best Improvised Jazz Solo for Alexander’s performance on John Coltrane’s “Giant Steps.” Among several standards including the Richard Rodgers title track, there’s even an original, “Ma Blues,” that he wrote at the ripe old age of 10. Yet prodigies are usually judged by their advanced technique and tone — but perhaps not their taste, or lack thereof — by nature. And as is often the case with Alexander, that technique and tone get displayed through flurries of notes that dazzle the listener — and more so because they’re coming from the hands of a 12-year-old than a veteran in his 20s or older. So some critics cite Alexander as, at the very least, a prospective cautionary tale. It’s possible that Alexander might turn out to be bored because his natural abilities make things too easy, and/or that the public gets bored if, at age 22, he’s still a standout pianist but no longer a prodigy — or thus the same curiosity. Yet Alexander didn’t even break a sweat while performing Eddie Harris’ standard “Freedom Jazz Dance” last month at the 58th Annual Grammy Awards at the Staples Center in Los Angeles. And though he didn’t win a Grammy, he lost to jazz giants in guitarist John Scofield and bassist Christian McBride. And he was also, of course, the youngest Grammys nominee. Gary Walker, artistic director at New York City jazz radio station WBGO, also testified on Alexander’s behalf on 60 Minutes. 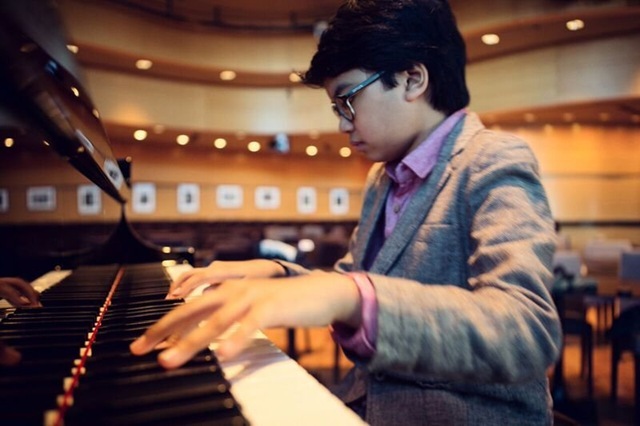 Joey Alexander and his trio (with bassist Dan Chmielinski and drummer Kyle Poole) perform as part of the 10th annual Festival of the Arts Boca at 7:30 p.m. Friday at Mizner Park Ampitheater, 590 Plaza Real, Boca Raton ($15-$100, 561-393-7984).